I'm beginning to think my childhood interest in astrophysics was an itch that should have been scratched harder. 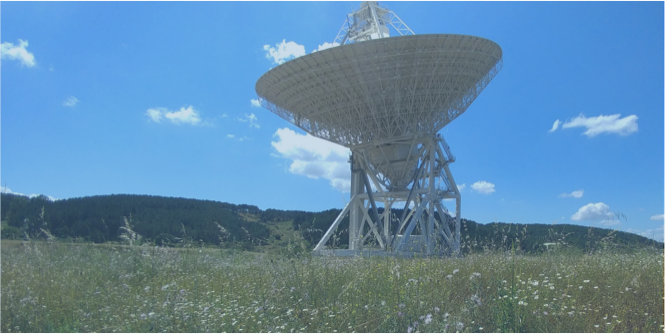 Case in point is my recent visit to Sardinia to promote SKARAB at the Sardinia Radio Telescope station. What an amazing state-of-the-art facility in such a beautiful location! One can easily imagine living la dolce vita here. Completed in 2011, the Sardinia Radio Telescope is a fully-steerable 64 meter dish with an active surface for its primary mirror that has over a thousand panels to control its shape to 150 micrometer RMS accuracy. SRT can point with 2 to 5 arcsec accuracy. Truly impressive. The antenna can be used alone or as an element in very long baseline interferometry. Its RF signal processing capabilities housed in the nearby control building are top-notch and include pulsar science capabilities. Great science has already been accomplished with the SRT -- many of the papers can be read on the SRT SCIENCE WEBPAGE. ROACH-2 FPGA computing resources are abundant as described in this paper. Soon SKARAB FPGA/ADC platforms are planned to be added to further cement SRT's advanced signal processing capabilities. So if you find yourself in Italy, do what I did...hop on a plane and make the trip to Sardinia... your soul and your intellect will thank you!